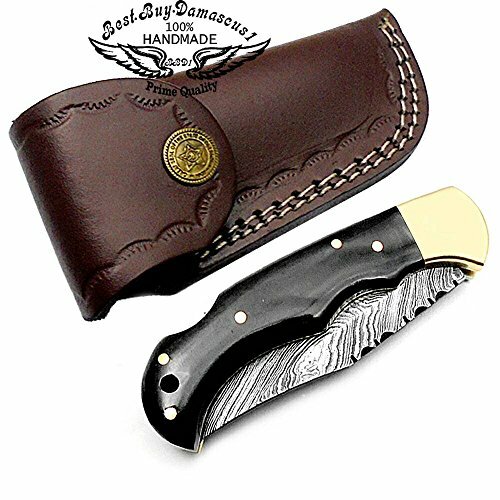 ●☆ THE 100% GENUINE BROWN COW LEATHER SHEATH: – The pure leather sheath of this amazing Damascus steel + Stainless Steel Folding pocket knives is made of prime quality thick cow skin to ensure excellent manufacture. The durable double stitching with the strong thick threads, in combination with the elegant, rust-resistant Brass button make a high-standard leather knife sheath to host safely your precious Damascus steel. ●☆ AN EXCELLENT GIFTING IDEA – We Offer this Beautiful unique Buffalo Horn Custom Damascus Steel Folding pocket knife to a special friend, family member or co-worker and have them thankful for your excellent taste! 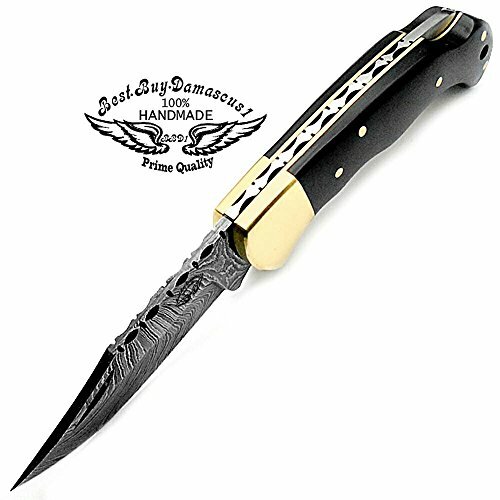 Make this amazing gift to any seasoned or amateur hand made knives collector and enjoy their smile upon unwrapping this fascinating gift! ●☆ RAZOR SHARP CLIP POINT BLADE – BACK LOCK BUFFALO HORN A PRECIOUS 100% HAND MADE DAMASCUS STEEL POCKET KNIFE – Real Beautiful Buffalo Horns unique piece of art made By “Best.Buy.Damascus1”! Manufactured of 100% Natural BUFFALO HORN, STAG HORNS ORor RAM HORN, CAMEL BONE or premium UNIQUE BLUE, GREEN , RED, ROSE, OLIVE, BLACK MICARTA or MULTI WOOD, this exquisite Damascus steel PLUS Mini Stainless Steel Camel Bone Sliver Bloster Pocket Folder We make Folding pocket knifes you will be proud of! Tradition has found a high-end way of expression in the seasoned hands of Best.Buy.Damascus1 manufacturers! 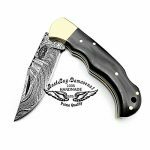 With a long experience in the manufacture of CLASSIC DAMASCUS POCKET KNIVES, they are offering a wide range of exclusively handmade Damascus steel Knives with Back Lock, so that you complete your own original timeless collection! 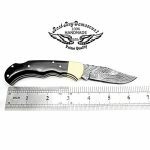 ☆ A BEAUTIFULLY HAND FORGED PIECE OF ART: With a Damascus STEEL BLADE nicely hand forged with above (276) layers combining (1095) and (15N20) high carbon steel and with a durable nickel layer, our steel Blade has been given excellent heat treatment to get a (58to60) HRC, ensuring top functionality and guaranteed longevity. 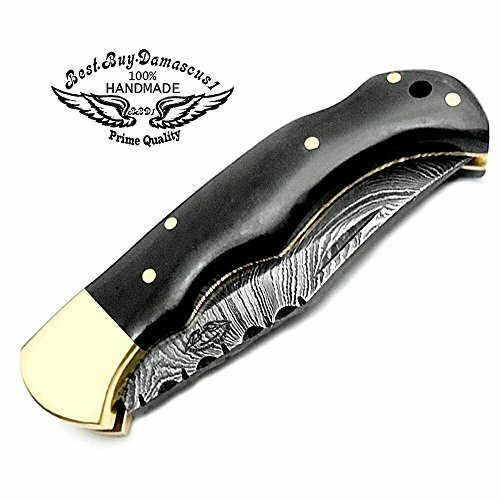 ☆ THE 100% COW LEATHER SHEATH The pure leather sheath of this amazing Damascus pocket knife: is made of 100% prime quality thick cow skin to ensure excellent manufacture. 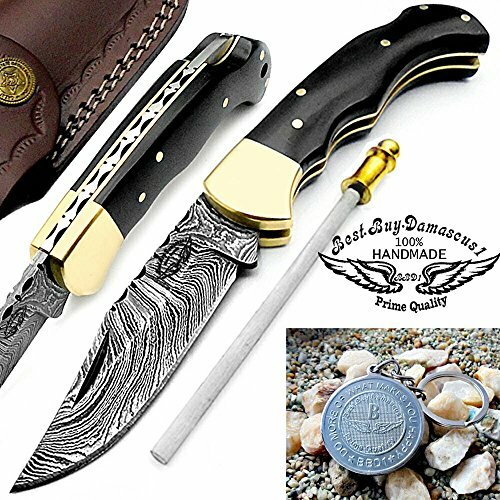 The durable double stitching with the strong thick threads, in combination with the elegant, rust-resistant brass button make a high-standard leather knife sheath to host safely your precious Damascus steel. 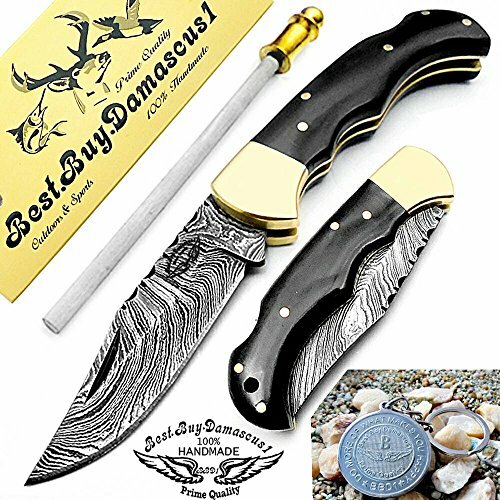 ☆ AN EXCELLENT DAMASCUS YOU ENJOY WITH ALL YOUR SENSES Feast your eyes on the classy: design of this elegant handmade Damascus knife! Feel its sleek texture with your hand and enjoy its lightweight, compact shape in your pocket! Enrich your collection with a priceless piece of art and enjoy the touch of style it offers! 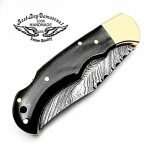 ☆ AN EXCELLENT GIFTING IDEA: Offer this unique handmade Damascus pocket knife to a special friend, family member or co-worker and have them thankful for your excellent taste! Make this amazing gift to any seasoned or amateur handmade knife collector and enjoy their smile upon unwrapping this fascinating gift! 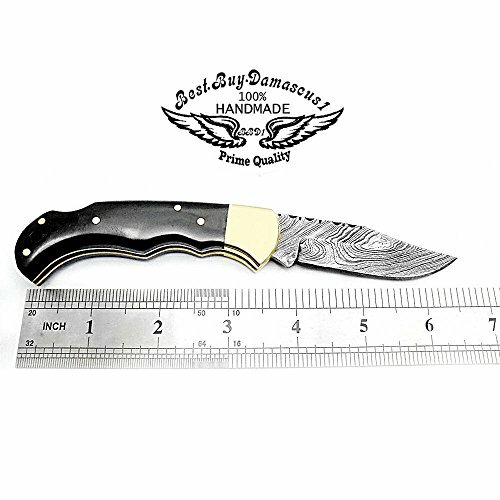 This item: Pocket Knife 6.5'' Buffalo Horn Damascus Steel Knife Brass Bloster Back Lock Folding Knife + Real Horn Handel Knife + Sharpening Rod Pocket Knives 100% Prime Quality+ Camel Bone Small Pocket Knife. 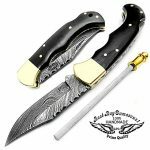 Pocket Knife Multi Wood 6.5'' Damascus Steel Knife Brass Bolster Back Lock Pocket Knives 100% Prime Quality+ Blue Wood Small Pocket Knife +Sharpening Rod Folding Knife.